I was firstly inspired to read this book after I read this review by Joy at The Stay At Home Missionary. A few weeks ago I ordered it for my husband and myself to read it together. The moment this challenging book arrived we began to read that very night. This book is simply inspirational! 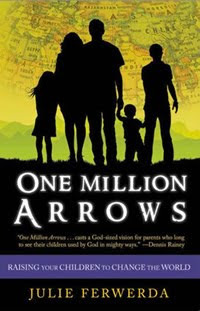 To all parents who wish to raise up godly children as arrows for the Lords work, this book is filled with ideas and practical ways in which we can achieve that. I very much enjoyed reading the inspirational stories of teens who are doing great things in the name of Jesus Christ and whom are changing their countries, cultures and lives of others people, in doing so. It was also insightful to read what values and goals the parents of these children had, for their families. This book challenged both myself and my husband as who we are as parents and what our goals are for our children and family as a whole. Julie Ferwerda tells the reader, the story of Dr M.A Thomas. A man whom has been rescuing abandoned and orphaned children in India for many years and now his mission work has also spread to Haiti and Malawi. Dr. Thomas tells of how he was challenged by the Lord through the scripture Psalm 127:3-5 to gather one million arrows and sharpen them for the His glorious works. I found the resources section in the final pages of this book extremely informative and encouraging. I was so excited after reading the last page (epilogue from Dr Thomas) that I was thrilled to find resources for books to enhance family spiritual growth, information given on ministries benefiting orphaned, abandoned and needy children worldwide. I was also pleased to see that it was indicated, at which ministries, were personal mission trips were welcomed. This book truly highlights and challenges us in our greatest mission for Christ. Will your family join the movement for Him? Why Not Stay At Home? The Sweet Things In Life!